I WAS surrounded by beautiful, hungry people on a wet Friday night in front of the ‘train’ at Sushi Choo@The Ivy (the most beautiful, of course, were the work colleagues I was dining with). Sushi Choo is a contemporary and classy sushi train-style venue on the ground floor of Justin Hemme’s trendy and fabulous The Ivy – a restaurant, bar and shopping behemoth. Hemme’s complex incorporates nine restaurants (including Sailor’s Thai) and 18 bars. Sushi Choo is on the ground floor of the complex. After a hard week at the office the five of us decided to venture into Sushi Choo before mincing at one of The Ivy’s fabulous bars with Sydney’s chic set. Tonight it was to be drinks at the open air pool bar (as it stopped raining), which is complete with a swimming pool, cabana and 70s funk-come-disco beats blasting in the background. (2) and because of (1) you can become too self-conscious and not enjoy the dining experience as much as you are forever watching what coloured plate you are grabbing and doing the math which of course can lead to not trying the variety that is on offer. Not so at Sushi Choo’s $20 All You Can Eat Sushi deal (which is available Tuesdays to Fridays from noon to 1pm or 6pm to 8pm) where you can select and eat as much as you want. Thankfully we arrived at 6pm just as the restaurant opened because within a half an hour it was filling fast. The Ivy’s Sushi Choo is contained in a room bathed in a red glow due to the large red wicker lanterns hanging around the room. Scattered in various positions around the room and near the tracks of the sushi train are Japanese pop cult toys and icons: robots, Astro Boy figurines, porcelain pigs and those wonderful maneki neko “waving lucky cats”. The sushi train winds around the entire room surrounded by a marble platform and despite the restaurant being almost at capacity, it was always crammed with sushi plates (Sushi Choo’s chefs continually restocking as empty spots came into view past the preparation area). Stools are spaced along the train and at every couple of ‘stations’ is pickled ginger, wasabi and soy sauce. The waiting staff are polite and unobtrusive and were discretely attentive when it came to refilling water glasses, taking further drink orders or removing stockpiles of empty sushi plates. So, what’s on offer and recommended? Seaweed salad: a beautiful mound of long and thin seaweed ribbons dressed with a spicy sesame dressing which was delicate, crunchy and a wonderful palate cleanser. Salmon avocado roll: Again, fresh, sliced salmon and creamy avocado wrapped in sushi rice. Dynamite roll: a spicy tuna and cucumber roll wrapped in sushi rice and sprinkled with fish roe. Chicken karage: crumbed and deep-fried chicken rolled in sushi rice. Gyoza: Steamed pork dumplings which were fat and juicy. Noodles: a pile of glass noodles lightly dressed and seasoned. Edamame: a handful of boiled baby soy beans (a classic Japanese bar food) where one ‘pops’ the beans from the pod. Fried prawns: prawns crumbed in panko flakes which were freshly fried – the prawn’s sweetness was not compromised by the crunchy and firm panko dusting. Salmon nigiri: Fresh slice of raw salmon belly on al-dente sushi rice. The salmon melted in the mouth. A favourite. Tuna nigiri: Fresh and deep red raw on top of sushi rice. Fresh prawn nigiri: A slice of freshly steamed and butterflied prawn on top of a mound of sushi rice. As you can see, the selection is limited during the $20 deal (but there is something for everyone and enough of a selection to be adequate). Diners can choose from the a la carte menu , among the highlights are a selection of hand rolls (up to $11 each); a bento box featuring miso soup, nigiri, sashimi, sushi rolls, beef tataki, chicken karage and served with a Kirin beer or glass of wine ($25); and the Chef’s Sushi Choo plate: a selection of assorted nigiri and sushi rolls with miso soup ($30). Sushi aficionados may scowl at the limited and uninspiring selection during the $20 All You Can Eat phase at Sushi Choo, but for a group content with making use of The Ivy’s other attractions (such as the modern and slick bars) it was a convenient and well-priced option before mingling with Sydney’s beautiful people. The verdict: Nothing out of the ordinary but definitely not ordinary. The $20 All You Can Eat sushi train deal is great value for money considering the quality of the serves (although a limited selection) and the hip and chic surrounds. The train offers a small variety of plates during the $20 deal (but you can order from the a-la-carte menu if you wish). 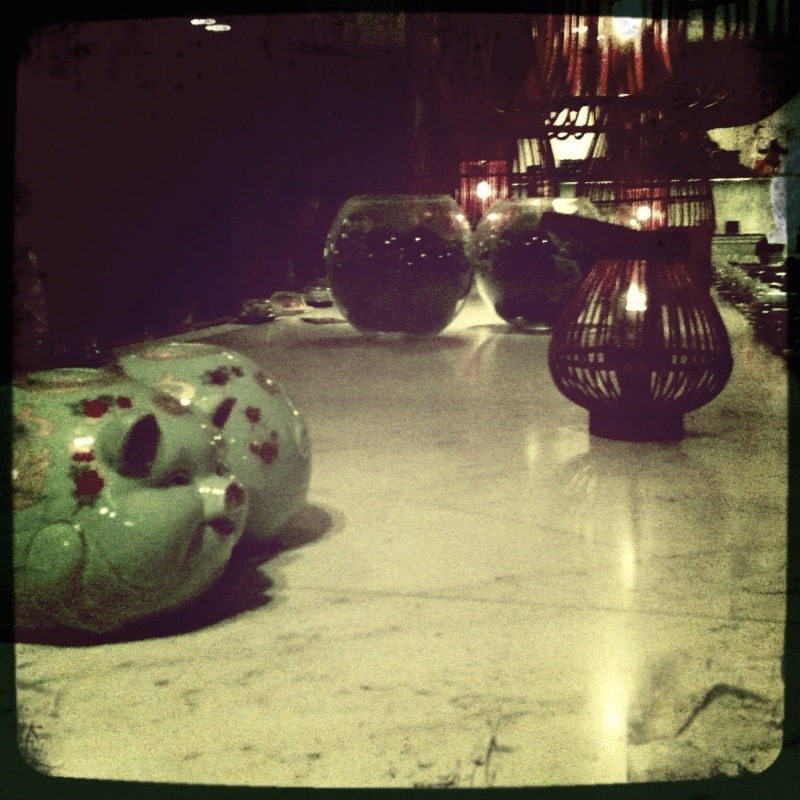 The attentive and professional staff are unobtrusive and don’t frown upon piles of empty plates. 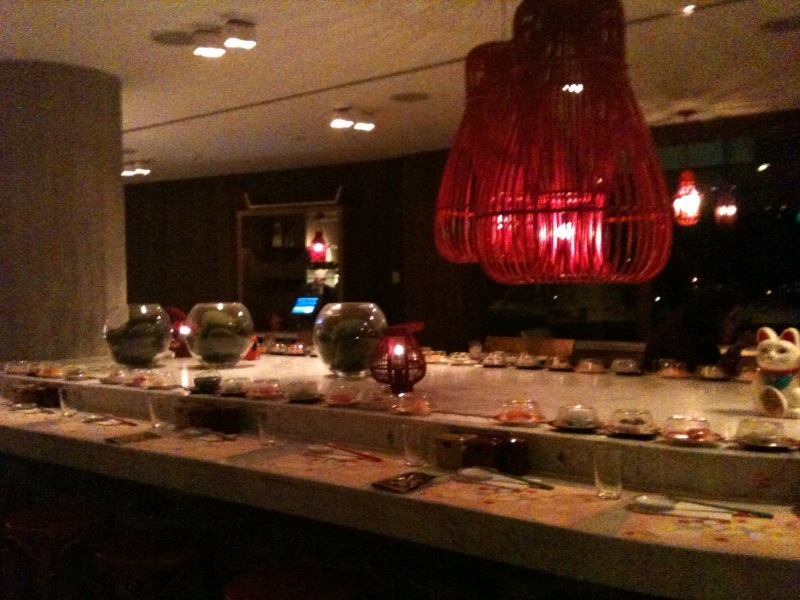 What: Sushi Choo (The Ivy) 320 George Street, Sydney. Phone: 9240 3000. Open Monday to Friday lunch (noon to 3pm) dinner (6pm to 10pm). Ate there: 5 June 2010. This entry was posted in Japanese, New South Wales, Sydney and tagged Australia, Food, Japanese, street food, Sushi Choo, Sydney, The Ivy. Bookmark the permalink. Even the non-seafood eater among us managed to fill up and appreciate the variety (and thats not even mentioning the liquid variety on offer) – thats a true testiment to its fabulousness! Indeed! Managed to fill up on delicious Japanese treats, however emptied my bank account with $20 Mojitos!! Well worth it though, the Mojitos were exquisite! I’m definitely going to get me some of that…!